Arriving at 2 a.m. was clearly all worth it. 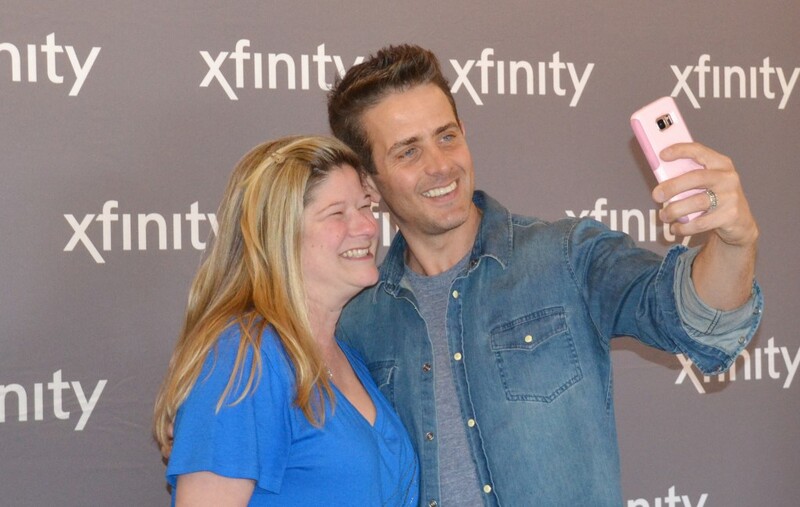 Heidi Funk, who was first in line with sister Heather Hadraba, smiles for a selfie with her ‘first crush,’ Joey McIntyre. Turns out, Joey McIntyre’s still got the right stuff. Hundreds of fans turned out for a free meet-and-greet with the musician and actor last Saturday at the new Xfinity store in Cherry Hill. McIntyre, rising to stardom as the youngest member of boy band New Kids on the Block in the ’80s and ’90s, was there to promote his new television series “Return of the Mac” — and also, evidently, to make long held teen dreams come true for some of his biggest fans. 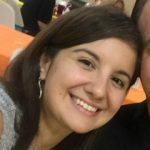 “I’ve been obsessed with New Kids since I was 15 and I’ve never met one in person,” Janey Kazazian said. 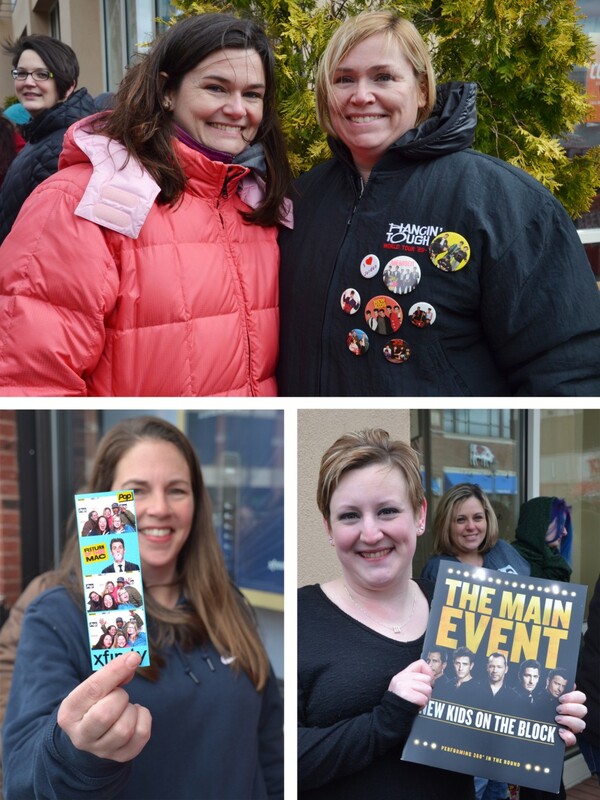 Sporting her 1989 NKOTB tour jacket and an array of swag buttons, Kazazian drove from Randolph with her sister Karen Kerschbaum — who came all the way from Tolland, Conn. — to meet their teenage idol. 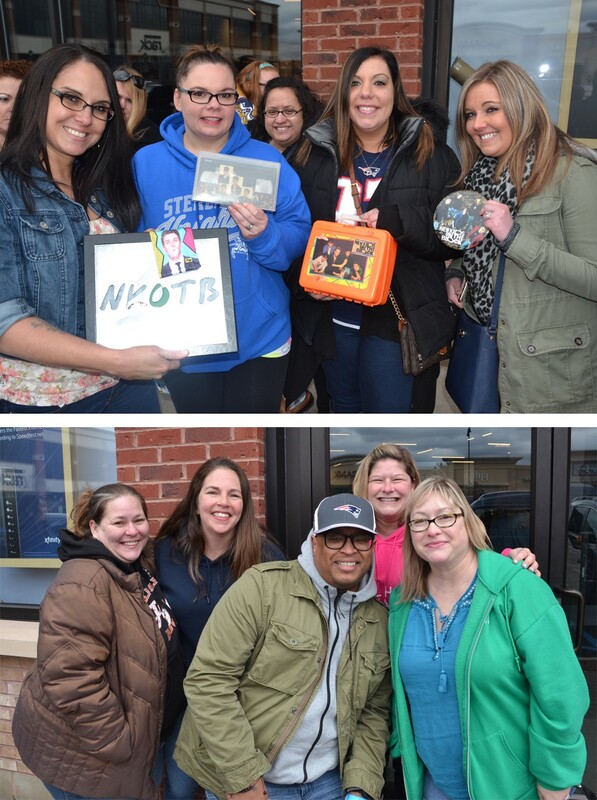 Clockwise from top: Sisters Karen Kerschbaum, left, and Janey Kazazian were ready to meet Joey, Kazazian even sporting a 1989 NKOTB tour jacket and plenty of swag. Jeanine Butterworth-Green brought along a NKOTB concert program. Kelly Collazo shows off a photo strip of she and her friends, taken while waiting for the start of the meet-and-greet. Most of the fanwomen found out about McIntyre’s appearance via social media. The Facebook page for the event was aflutter with activity Saturday morning, with fans announcing their early morning arrivals — and need for coffee — and others asking the length of the line. Arriving early was critical since, depending on turnout, not all fans would be guaranteed a chance to meet McIntyre. Heather Hadraba and Heidi Funk took that warning to heart. The sisters were first in line, arriving at 2 a.m. to stake out their spot on the sidewalk. Even the cold, misty rain that rolled through during the early morning hours couldn’t dampen their enthusiasm. “We did not want to be in the back of the line,” Hadraba said. Fans brought along a myriad of NKOTB memorabilia, from VHS concert recordings to faded lunch boxes to tattered, well-loved posters. Lynn Promise clutched a Joey McIntyre doll, still in its box. While waiting for Joey McIntyre to arrive, Liz Jacobs, left, Lynne Promise, Heather Peltz and Julia McGuckin strike a pose. 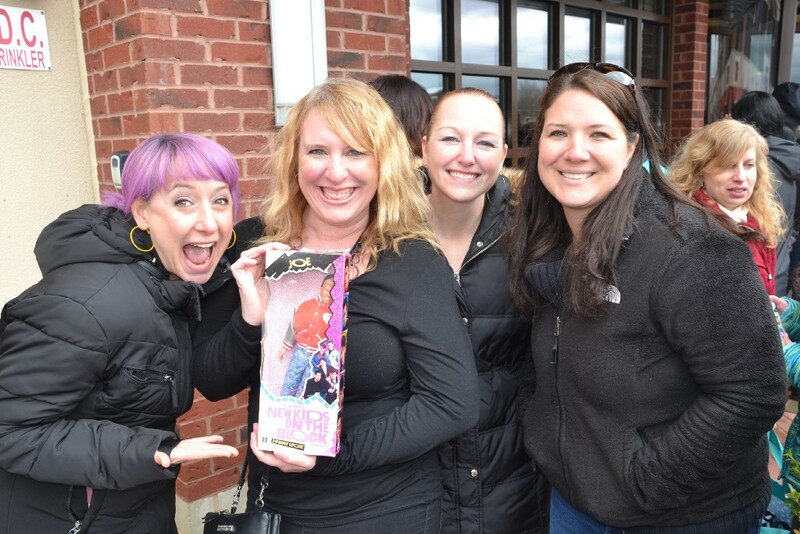 Top: NKOTB merch abounded, including this array of memorabilia displayed by, from left, Zulette Gonzalez, Amber Salerno, Rita Hobbes, Gina Prelle and Crystal DiGirolamo. Bottom: These five friends were truly ‘hangin’ tough’ to meet Joey, braving the cold and early morning rain to stake out their spot on the sidewalk. From left are Jill Wintjen, Kelly Collazo, Barry Lindenmuth, Heidi Funk and Heather Hadraba. And when the real thing arrived just before 11 a.m., it was to a chorus of cheers. Indoors and out of the cold, McIntyre took a few minutes to discuss “Return of the Mac” before posing for selfies with his fans. The reality-based comedy stars McIntyre alongside his real-life family in their real-life house, following his journey trying to become an actor, but instead halfheartedly taking on the role of a talk-show host on a small cable network. McIntyre came up with the show’s concept alongside producer Paul Greenberg, who he met through Donnie Wahlberg, also of NKOTB stardom, and actress Jenny McCarthy. “Return of the Mac” debuts at 8:30 p.m. on Wednesday, April 12, on PopTV, and if Saturday was any indication, South Jersey will certainly be tuning in.